One Starry Starry Night while everyone else was dreaming, I swirled fantasies on top of cupcakes. Little fantasies that tasted like vanilla almond rainbows. 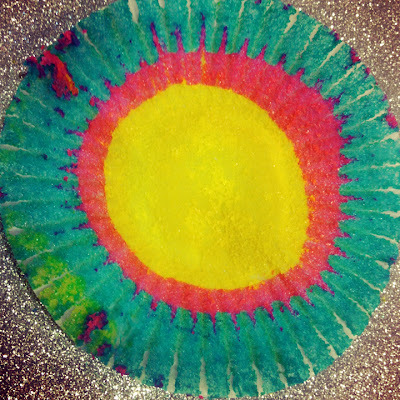 At the first warm & colorful bite of my rainbow cupcake creation, I "remembered" that I had "forgotten" a wild food fantasy from the days before anyone ever called me Amanda Cupcake. Back in my angsty teen days, I was a painter. Art was my favorite class, painting was my outlet. Even back then though, my instincts yearned for something beyond paint. I wished that I had the tools to create *edible* art that had never been seen before. Paint that I could eat. I started envisioning a new colorful creation. Ice cream themed after famous paintings. Like Van Gogh's Starry Night--inside of an Ice Cream Carton. I envisioned myself opening the carton to reveal a frozen replica of my favorite legendary painting..as ice cream. I thought that the neatest thing ever would be if I could dip my spoon into a soft dairy canvas, and as the ice cream melted, the "paints" would blend together into brand new colors I never even knew existed. Sort of like Superman Ice Cream..but more "fantasy" than comic strip. 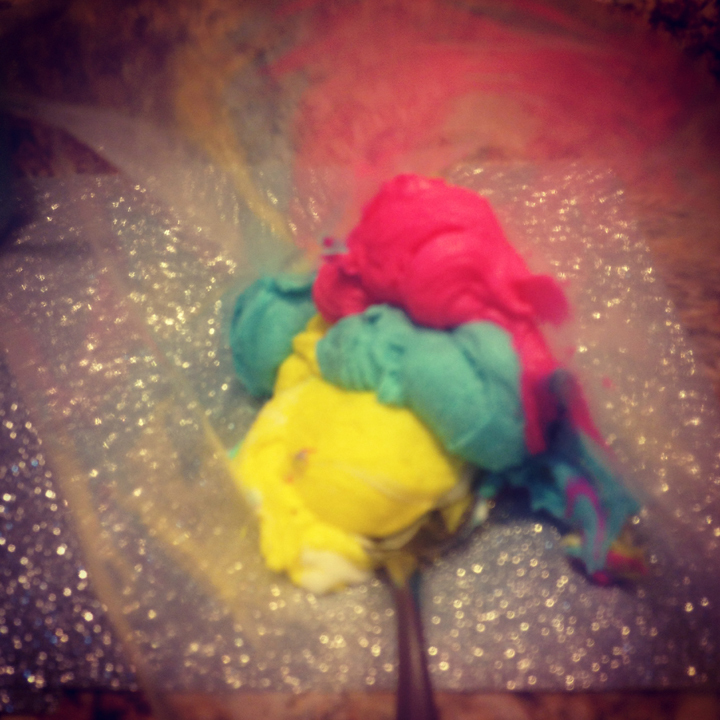 My rainbow fantasy cupcakes that I dove into, buttercream first.. were a real life version of "paint that I could eat." My teenage fantasy come true. Even though this wasn't ice cream, the colors in the frosting and inside of the cupcakes evolved with every single vanilla almond bite. Just like my vision. And the best thing ever...I actually did create these cupcakes on a starry starry night. The starry starry night can be recreated on the cupcake by lightly sprinkling Hologram Silver Disco Dust on top of fresh frosting! Disco Dust: There have been many questions about the Disco Dust being "edible". 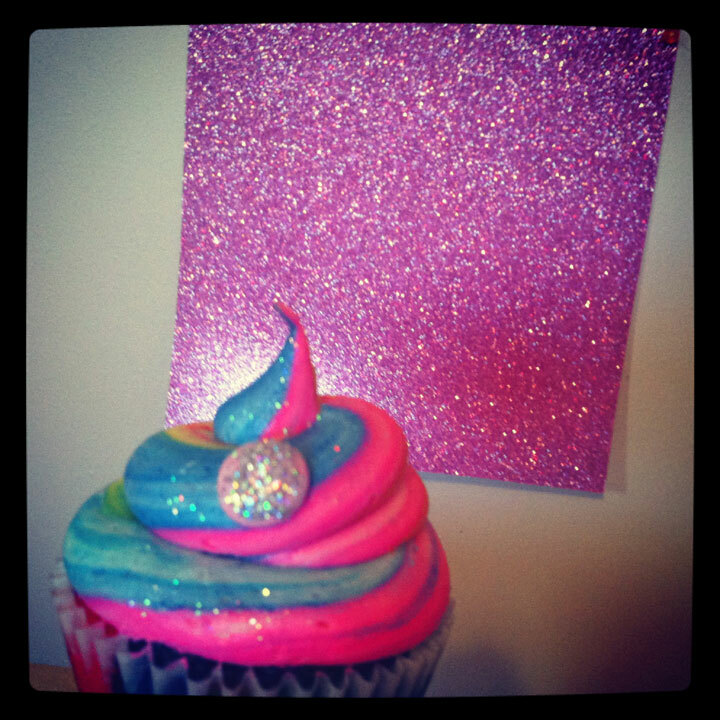 Here's my answer: I use it on the cupcakes on my blog to make everything look super sparkly and fancy. I don't sit down and eat it by the spoonful. It sells at my local cake decorating supply store, and I put it on top of things that you can remove from the cupcake. You can use crystal colors pearl dust or use crystallized sugar sprinkles that are at your local bulk food supplier, I do that for the cupcakes I use in production to get the same effect. If you think about all the things people eat or drink in this day and age, a little bit of glitter is pretty innocent, so if you want to sprinkle a tiny bit of disco dust on your cupcake, I know from experience working with it and eating cupcakes that have it on it for several years that it basically just passes through your system harmlessly. You might end up with a little bit of "unicorn" glitter poo. 3.9-4 oz White Chocolate Pudding in Dry Powder Form (the pudding gives it that "from scratch" texture). A friend is always good to bake with. ♥ I'm lucky to have two of the cutest little friends ever, Hanna and Rainy. I call them my "Mini Me's'"
My edible paint colors that I swear by for fantasy rainbow cupcakes and their frosting. 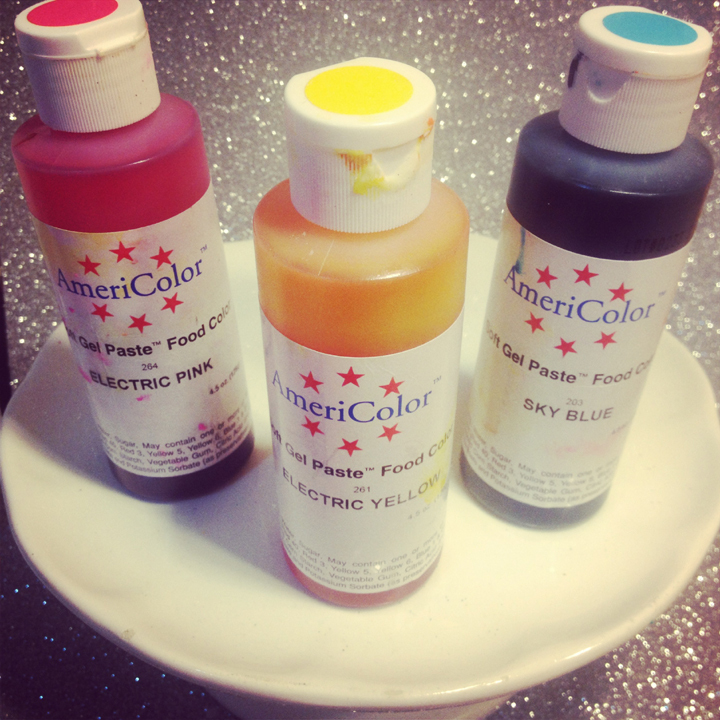 Americolor Gel Paste in Electric Pink, Electric Yellow, Sky Blue. (You can buy these here or at a local cake decorating supply store). Step 1: Combine all ingredients in stand mixer and whip together well using flat beater attachment. Step 2: Take out 3 separate bowls and pour about 1 1/2 Cups of batter in each bowl. ♥For Sky Blue: Mix two small drops of Americolor Gel Paste in one Vanilla Batter Bowl. ♥For Electric Pink: Mix three to four small drops of Americolor Gel Paste in a separate Vanilla Batter Bowl. ♥For Electric Yellow: Mix three to four small drops of Americolor Gel Paste in a separate Vanilla Batter Bowl. (I use more drops of color for the yellow and the pink so that the colors are really vibrant). 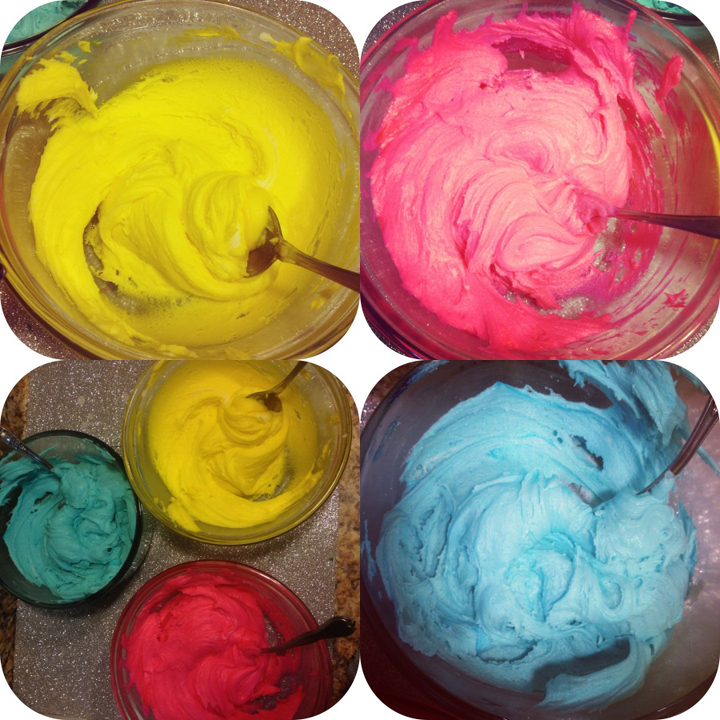 Step 4: Stop and gaze at the beauty of your bright batter colors in each separate bowl. 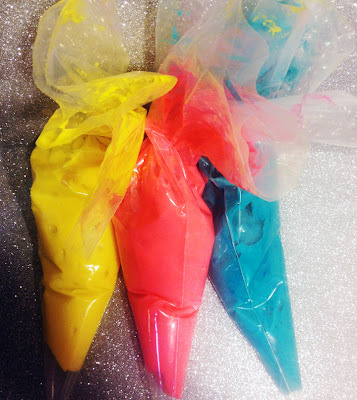 Pour each color of batter into a separate disposable piping bag, and cut a small hole at the end of the piping bag. ♥Cover the bottom of your cupcake liner with electric yellow batter. ♥Repeat by piping electric pink on top of your electric yellow batter. ♥Repeat again by piping Sky blue on top of your electric pink batter. 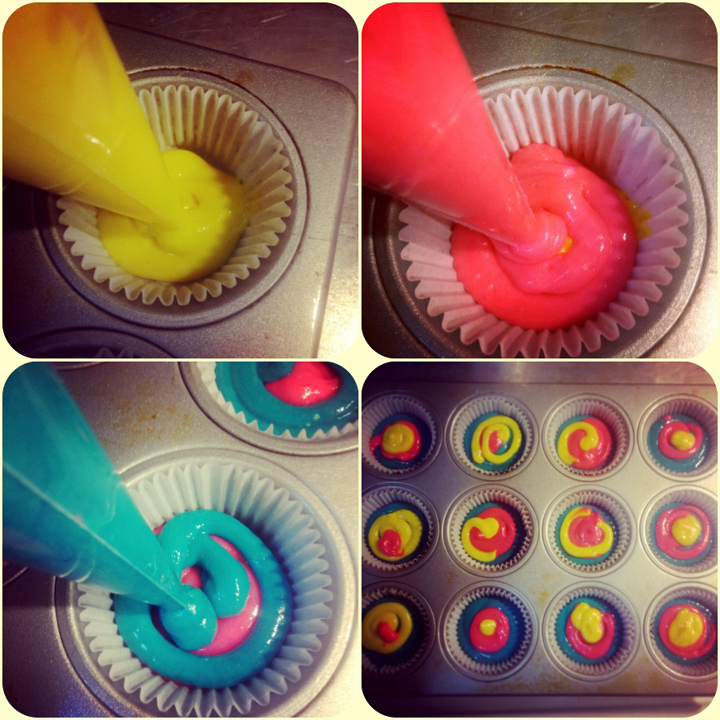 ♥Now you can add little swirly swirls of extra color, until your cupcake liner is filled 1/2 full. ♥Bake at 325 for appx 18-22 minutes, until a toothpick inserted in the center comes out clean. ..and taste test. I did. The cupcake is...gone! Look how pretty the cupcake liner looks alone! You don't even need to buy the fancy schmancy ones at the store. This started out as a plain white cupcake liner. I use a homemade buttercream for the best swirl texture. I swear by Marshmallow Creme as the base for my frosting. I use 13-14 oz in my frosting recipe. 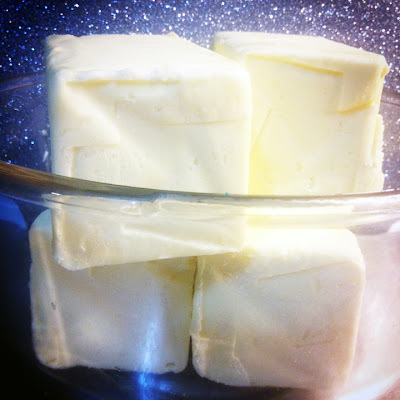 See full recipe for buttercream frosting below. Just like my batter, I separated my frosting into 3 bowls. Then I mixed each gel paste color into a separate bowl (about 3-4 drops per bowl--you can always add more color if you want the color to come out more vibrant). Electric Yellow, Electric Pink, Sky Blue. Hint: If you want your frosting to look more "Unicorn-esque" like these cupcakes... (these colors remind me of Unicorns! ), I use white in place of yellow. Or still use the yellow but add white too as a 4th color. 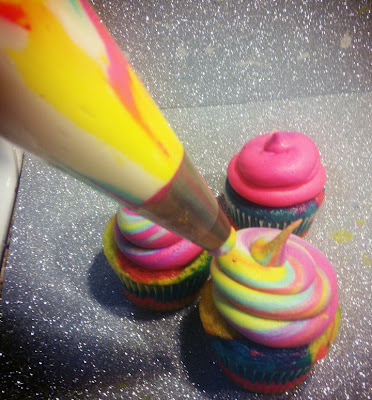 To pipe a multi-color rainbow swirl: I stacked each color of frosting on top of one another inside of a disposable piping bag. ♥ Your piping bag will look so pretty from the outside, like this! This is the view from the inside of the piping bag, as I am stacking the sky blue, electric pink, electric yellow buttercream frosting colors on top of each other. For a dreamy puffy fantasy swirl, I use a round Wilton 1A Piping Tip like in the picture. Before you stack the frosting inside of the piping bag, cut a hole in the end of the piping bag big enough to fit the tip, and slide the piping tip down into the end of the piping bag. ♥No cupcake will look the same. When all three-four colors blend together inside the piping bag you'll start seeing greens, purples, turquoise colors swirl a fantasy rainbow onto your cupcake! ♥Where you might need patience: For the brightest colors possible, switch piping bags every time your piping bag runs out of frosting. This prevents colors from turning muddy or brown. The final product. My signature rainbow fantasy cupcakes. Use a spatula to scrape the fluff and the butter out into your stand mixer. Mix well until fluffy and well blended. Gradually add a pinch of salt and vanilla extract. Now add your powdered sugar, slowly until the frosting reaches desired consistency. (The more powdered sugar you add—the more stiff the frosting will be for decorating). 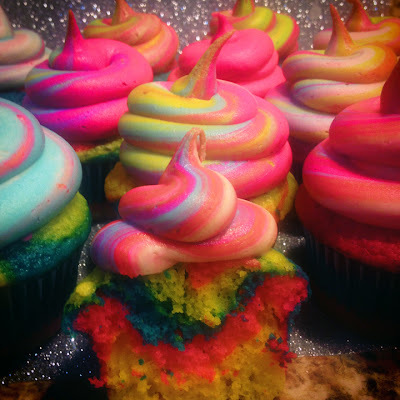 Some may also call my rainbow cupcakes "Unicorn Poop" Cupcakes. 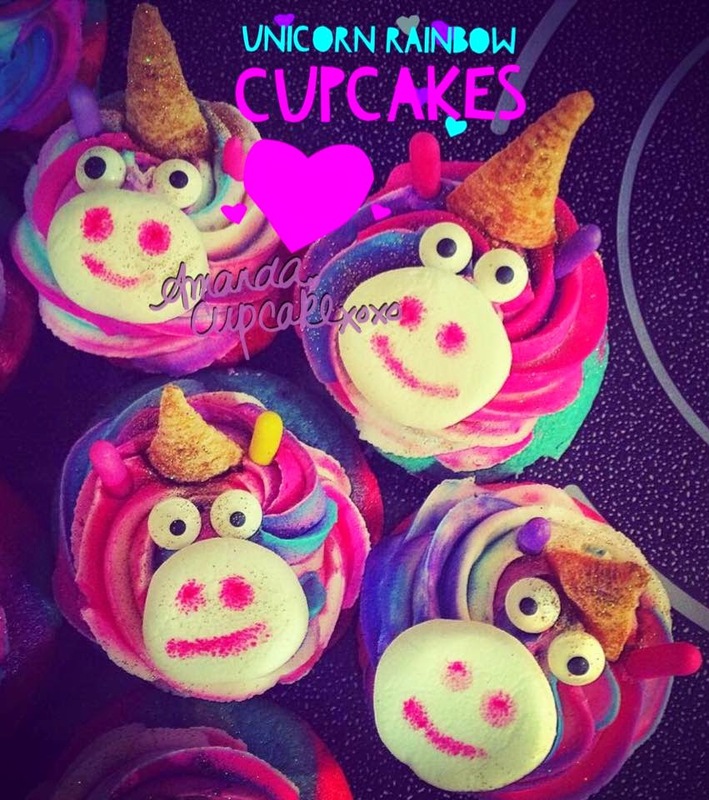 Or you can just make Unicorns out of these cupcakes like I did here! I used Bugles as the horns, sugar eyeballs as the eyes, marshmallows cut in half for the nose and I drew the faces on the 'mallows with an edible ink marker. Last but not least, I used little rainbow colored licorice pieces for the ears! Reminds me of the "Fluffy Unicorn" in Despicable Me! Hello Amanda, Your cupcakes are wonderful. So much love . . . I know that my granddaughters would love helping me make them this summer. I am hoping to have them for two weeks this summer while my daughter is on a medical mission in Honduras. I was just out looking for ways to make my summer backyard parties memorable, when I found your blog. I am your newest follower. Please accept my invitation to visit and hopefully to follow me back. I'm a retired "Jill of all Trades", I love art, music, baking, gardening, sailing, DIY decorating, junking . . . I'm just enjoying life and trying to pack as much fun into my last years, as I slowly slide down the far side of over the hill, LOL. Thank you so much Connie! You are adorable and wonderful. I am going to check out your page too. :) I'm about to post another blog here today. Let me know if you ever try any of my recipes! Hello, I am looking into making these next week and just wanted to ask; do I put the pudding mix into the dry ingredients, or make the pudding and then add it in? Hi love! Use the pudding straight from the box..dry. Can I use regular food coloring? OMG! Love the colors! So beautiful! How much frosting do you end up with? I mean how many cupcakes can you frost with it? Thank you Annie! I guess it depends on how high your swirls are :) Usually I can frost about 18 cupcakes with that frosting recipe. so pretty!! where did you get that super glittery glitter?! edible, I assume? Would it make a big difference if you used salted butter and not add any extra salt? These cupcakes are awesome! I'm going to attempt to make them and hope they turn out as beautiful as yours :) Do you use instant or cook and serve pudding? Or does it matter? MUST try these, hate that the uk doesn't have ingredients like this in high availability but will find something I'm sure! 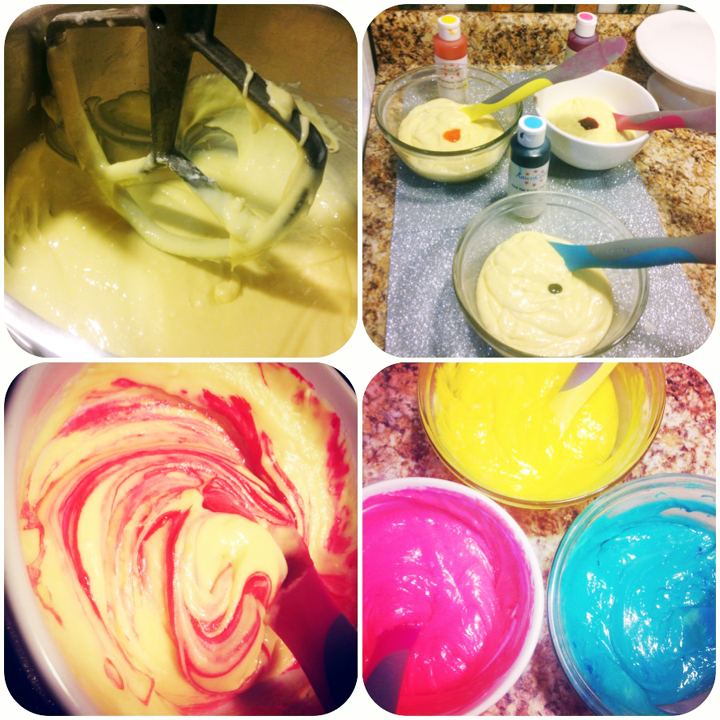 1 - the cake batter was yellowish therefore when I added the blue coloring it turned greenish. I had to use alot of blue to get it "blue"
Hi there! Thank you for the compliment! You can replace the vanilla pudding with white chocolate pudding to make it more white, the vanilla pudding is more yellow. As far as cupcakes falling there could be many reasons, it's hard to tell unless I am there with you. Cake mixes can be a bit unpredictable-so it could be just the cake mix. Or your oven could be different than mine, make sure you bake them long enough and test them with a toothpick before they are taken out of the oven. No batter should show up on the toothpick when you test them. Also when you mix them try putting the eggs, oil, and liquid in first, creaming this together and slowly add the dry mix to these ingredients to make sure everything is evenly blended. Make sure you bake the batter right away and don't let it sit out for too long before baking since the baking soda in the mix (which is what helps the cupcakes rose) is only really active right after you mix ingredients together. Hopefully one of these things work for you. :). When I teach cupcake classes we always use this one and it works every time. But then again I'm there in person so we go through each thing together step by step. Thank you for your response! The only thing I did different was that I combined the dry ingredients then added the wet. Then I seperated the batter into 3 bowls and added the coloring and mixed and mixed to get the vibrant color and blend it completely. Maybe I overmixed??? The grandkids were happy to be taste testers! Made these and arranged them in a castle formation with upside down ice cream cones for towers. I used regular coloring instead of paste and plastic bag instead of piping. What an absolute delicious mess! Turned out so cute for my daughter's princess birthday. Posting this review in procrastination of scrubbing frosting off my backsplash. Is the almond extract necessary or is it just for flavor? Do these need to be store in the refrigerator? Really would like to know how you get the glitter effect. Please let me know as it looks like a few us want to know. Thanks again -- 25 very happy 3rd graders appreciate the recipe. I just wanted to say that for someone who wants to take her business "worldwide" (and having applied for SharkTank), it's pretty laughable that you completely ignore the people who would HELP you do that and be successful - your viewers/fans/customers. SEVERAL people have wasted their time to message/compliment you here, and have only asked for clarification on your post (about the Disco Dust not being edible), only to be ignored over and over. (There are several other questions/comments ignored as well.) When I found your site (recommended by another site), I thought it was delightful & fun, but by the end of the post, and all of your viewers being ignored, I think you're rude, and that you obviously don't care about your viewers, and therefore, I'm not wasting anymore of my time coming back here, nor will I have a nice word to say about you, thus helping your future "business" plans. I suggest in the future that you pay more serious attention to those that *should* matter to you. Hi there! I am sorry you feel that way, I have fallen a little behind this year on my blog in general. If you notice I don't post as often. My business itself has been in transition and I've moved my entire kitchen. I also ended up in the hospital and was recovering for awhile. I am just starting to get back on my feet again. So while it seems I was ignoring customers, I was actually going through some stuff and taking care of myself. Hoping to get back into my blogging and a whole lot more going forward. I appreciate your opinion and I will use it to improve but I would like to remind you to be kinder next time. You didn't know the reason that I hadn't responded. Hi there! Sorry it has taken me awhile to respond-but I can tell you the disco dust is sold in cake decorating stores. You can use little bits here and there to decorate your cupcakes, I have done research on it and it basically goes just goes in your mouth and out of your body. Just as anything else (butter, high amounts of sugar, etc) it isn't something that I would overeat. 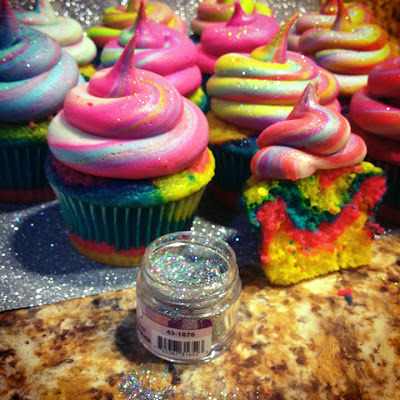 I always put it on gems that are on top of cupcakes (like a PB cup) and use crystallized sugar glitter that you can also buy at cake decorating stores to do more of a glittery impression. Hi Jessica, the almond extract is an added bonus :) If you don't like almond or are allergic, you can choose not to add it! Hi Kyla! Anything with butter or milk in it needs to be refrigerated. Before you serve them, you can pull them out of the fridge and let them sit for an hour or so before eating . They are easier to eat at room temperature! They last for 30 days in a freezer as long as they are covered with plastic of some kind! Hi Kelly! You can buy disco dust at your local cake decorating store. You can also buy luster dust or decorating sugar crystalz. All of them look really pretty on cupcakes! Hi there! I use instant pudding, in dry powder form. :) Hope that helps and I hope you created something beautiful! Love it! Post photos of your creations if you can! Your work is beautiful! I can't wait to try some of your creations with my daughter! I was so enjoying reading the comments and feedback from other readers until I got to Miss Kinkyinkuffs. Why did she bother commenting? That was so incredibly rude and uncalled for. Talk about a damper! Keep on creating and blogging! I'm looking forward to future posts as I just found you! Im doing cupcakes for a My Little Pony birthday and I really like the way this looks but the kids whose party Im doing this for are super picky and wouldn't go for the marshmallow. 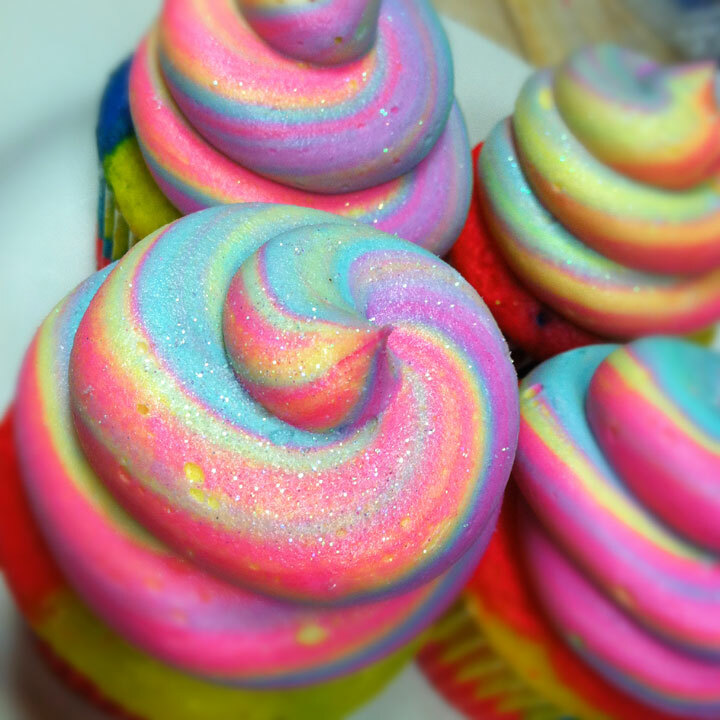 The thing is the colors are brighter in this picture then in any other rainbow frosting I have seen. Have you done any other rainbow frostings? And did they come out as bright and vibrant as this one? Thank you Lisa!! I hope you have had fun baking with your daughter! Share pictures if you can!!! Thank you Rachel!! :) I hope you have an awesome time with your daughter. ♥ She would have loved it, I had a unicorn at the parade I was in last week.. it was a mini white one! Hi there Maggie! You can't taste the marshmallow and it isn't sticky once you get all the ingredients mixed together, it more or less gives your frosting more texture for the rainbow swirl because it has a nice fluff to it :) if that makes sense! I consistently make the brightly colored rainbow ones in these colors and sell them at the local grocery store. An easier way to get the bright colors on a consistent basis is something fun that I discovered-you can buy one larger piping bag (maybe one 12") and 3 slightly smaller piping bags. Fill each smaller piping bag with a different color. Drop the 3 smaller piping bags inside of the bigger piping bag and when you pipe the frosting out, they colors will come out more consistently vibrant. I think there are also piping bags coming out soon that you can buy that are pre-made with the separate rows for different color of frosting, I have seen them at houseware shows but I am not sure if they are sold retail yet. That will make it even easier! Hi there. On the box it says 3 eggs. Is the extra egg due to the pudding mix and also is it ok to use 2% instead of buttermilk? Hi there! 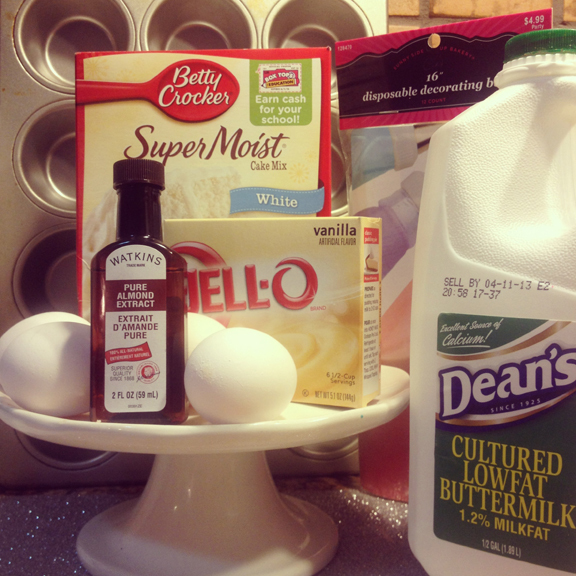 I always use 4 eggs when I doctor up a cake mix for cupcakes, it makes them more fluffy like a bakery cupcake! You can use milk instead of buttermilk, what I have discovered when you use milk in place of the buttermilk is that the cupcake doesn't end up as fluffy and won't rise as high but it will still be yummy! Happy baking! Please! Disco dust is plastic craft glitter. The FDA doesn't consider it an approved food additive, but they do consider adding it to food an "actionable offense". No one knows what sharp, tiny particles of plastic can do while attempting to migrate out of a human gut. You can't assume that it all just merrily passes through. Maybe you get little bits stuck in places where they can create the perfect spot for bacteria to gather and wreak havoc. That's equally as likely as any other scenario. Blakes Cakes as you and I have already discussed several times, I have updated my blog since this last post above stating that there are alternatives to using disco dust if you are concerned. I use disco dust to make my cupcakes look extra sparkly and beautiful in my photography and at shows. I have seen this done by other very popular cake decorators at shows as well. I am in the process of making my own sparkles and sharing a recipe as you and I have already discussed over private email. I am not trying to hurt anyone with my baking and decorating, quite the opposite actually. Well, Amanda, first and foremost, thank you for leaving my reply in place. Most people simply hit the delete button and never enter into a dialogue. The cake decorators you are emulating are WRONG in their use of disco dust on food, but this is a great example of the issue of people seeing something and then repeating it without knowing the specifics. I'm trying sooooo hard to disabuse people of the idea that disco is OK to eat. Every single day, I fight those describing disco dust as "edible glitter" or suggestions that "a little is OK", "it'll pass right through", "all you'll get is glittery poo", "other people do it, so it must be OK", "we eat lots of bad stuff, so what's a little glitter", and "but it's so pretty"--ever possible minimization and rationalization for eating/using the stuff that you could imagine. There's no place for leaving the door open, as though it's an option to use disco dust directly on food. People need to see facts, too, and that's what I'm trying to provide. New blog posts with edible recipes will be wonderful, but I see THIS blog post re-Pinned over and over, continuing to give the same visual and written information. No one can "un-see" the photo with the cupcakes in the background, open pot of silver hologram disco dust in front of them, and a cheery reassurance about eating disco dust printed below. I just continue to hope that some of those Pinterest people will read as far as these comments...........Of course you're not trying to hurt anyone. I've never accused you of anything like that. I'm sure that the popular decorators who influenced your choices weren't trying to hurt anyone, either--but they did because they led others to believe that plastic craft glitter was edible............and now it's an epidemic on everything from cupcakes to ice cubes and little kids and giddy brides think that it's just fine to eat..............Maybe my article in the May/June 2015 issue of American Cake Decorating will help to stem the tide. Even with all your bitching & complaining - no one has been hurt by disco dust in over 15 years! So "blakescakes" why don't you leave this poor girl alone & quit highjacking her blog & scaring people! There has not been one case of anyone who has ingested this product - getting sick, having ill side effects, or dying from it .... so I doubt that anyone needs your whining & crying to save a life! There are clear warnings on the product & products like it sold under different names but is the same exact thing that has been around longer than disco dust - how it should be used if consumed, etc.... so really??? I think this is just a ploy for you to make this poor girl look bad! It's in your screen name that you too bake and most likely have sites, blogs, facebook pages, and other outlets that you post things --- is it that your sites are doing so poorly that you have to highjack everyone elses??? Just a shame because you seem like a big cry baby and nothing else! I think the "non smoking" blogs could use your help since smoking has actually been proven to harm people! Grow up dude & leave this girl alone & other blogs/sites you have highjacked just to scare their readers & followers hoping to get them on your own - do your own hard work & leave others alone - you want to keep going on about this product then do it on your own site & not on others!!! How sad for you! Well, Jim F., Amanda and I have had a pretty decent interchange about all of this, so your vitriol is hard to comprehend. She's been very mature and kind--allowing my comments to stay posted, responding to me, etc. I hardly think that having a written "conversation" with someone is "hijacking" their site, but apparently you think that no one should post anything unless they are in full, sunny agreement with someone. That's not how grownup interactions work. I don't have a personal blogs/site to direct people to, so I have no personal gain here. The only "gains" that I've made have been in education and in having multiple bloggers and several vendors change their descriptions and understanding of disco dust usage. I am doing my "own hard work" trying to get people to fully understand a product. And I'll continue to post in places where I can get that word out, despite the fact that it seems to bother YOU so much. What on earth makes you think that your silly rant will make me want to stop people from putting plastic craft glitter on food? You don't know ANYTHING about what has, or hasn't happened to people ingesting disco dust over the past 15 years! We do know that consuming plastics is harmful to humans. Back when commercial cigarette production began, no one knew what it did to people, either. How is this issue so different? So you're saying I shouldn't eat the disco dust?!? Ehhh screw it I'm eating it! Love your site Amanda. I'll let you all know if we die. Hello Amanda, I have never been on this website before... so great job! Also, how long does this recipe take to make? :) This made me giggle. Thank you. Cupcake Hugs! Thank you Kelly!!! You don't have to use the marshmallow cream or fluff as a base. You can just use butter but use 1/4 Cup heavy whipping cream or milk instead of the marshmallow cream. You may need more powdered sugar due to using more liquid. Hope this helps! Can I use cool whip or redi whip instead of marshmallow fluff? 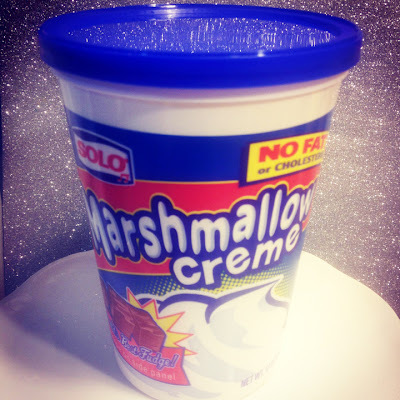 Hi Amanda, I read on another link someone commented that you can use normal melted marshmallows if you cant find marshmallow creme. Would that actually work? Thanx for recipe, definately making these! I don't understand why you think she should have to explain the same exact question over and over and over again just because people don't want to read her response to the same question someone ends has asked. I read her response to the same question 6 times before I had to stop reading. You also need to understand that she had a life off of the internet, you may not, but others do! Try to be a bit more respectful and kind. Hi Amanda, I used your recipe to make close to 200 mini cupcakes for a friend's 60th birthday! They turned out great! I plan on using this recipe again, thanks for sharing! Do you think this would work with darker colors for Halloween? Hi Amanda, love your blog, and can;t wait to make these cupcakes. Do You use the whole of the 4 eggs or just the egg whites? Also with the pudding is it added to the cake mix, or prepared as per packet instrucion first? I have to agree with Jim F., go somewhere else BlakesCakes. Us adults understood what Amanda stated about disco dust and will make our own decision without your over-preaching the subject. These are fabulous! Do you think this frosting technique would work for like red, green, white at Christmas? Or red, white and blue at 4th of July? Trying it at my girl's b-day here in Israel! I am making these for my son's birthday, he's 6. Since we will have both boys and girls there this is a perfect recipe/design for both! I bought blue and pink sugar sprinkles for "sparkle". I will post pictures(if I can) of how they turn out. I am hopeful!! Thanks for an easy and awesome recipe! You are so welcome!! Happy Baking to you!!!!! I hope you will share pictures! How did they turn out? :) Would love to see photos! Thank you so much! You definitely could! I figured out a new way to make the colors even more vivid. Put each color of frosting in a different piping bag and cut a hole at the end of each piping bag. I flatten the piping bags a little and insert all three of them inside one bigger piping bag and pipe the colors out! They come out really vivid. That would especially work well for the Christmas colors or the 4th of July colors! Hi love! Thank you so much. I just saw this post, my apologies! You could do either the egg whites or the eggs. I prefer using 4 whole eggs though, it makes it fluffier and softer. Egg whites make it a little more stiff. You definitely could! I figured out a new way to make the colors even more vivid. Put each color of frosting in a different piping bag and cut a hole at the end of each piping bag. I flatten the piping bags a little and insert all three of them inside one bigger piping bag and pipe the colors out! They come out really vivid this way. That would especially work well for darker colors so they don't turn muddy. Wow! I am honored! Did you take any photos? :) Would love to see your beautiful creations! Do you have to use the Almond Extract or can you use Vanilla Extract or none at all??? I will give you a little secret..if you cover them with plastic and freeze them after you take them out of the oven you could bake them up to 30 days in advance! Thank you so much for the love!! I need to make 2 dozen, how do I adjust the recipe? Amanda, I just made these and they turned out wonderful. You were so generous to share this recipe. A couple more pointers for readers: it may be helpful to use extra large bags, have several tips ready for change out, and use clear vanilla. I had so much fun with this recipe. The marshmallow fluff is brilliant. Of course they don't look as pretty as yours but it's not a Pinterest fail either! Wish I knew how to post a photo! I just finished making these for my daughter's birthday party. They are beautiful! I didn't expect anything too extraordinary in terms of flavor (a cupcake is a cupcake right? ), but I was bowled over. The cake and the frosting are delicious. You definitely have a winning recipe! Thank you for sharing! These are so fairytale like!!! My daughter said "that's it, that's what I want for my birthday, mum!" So I'm wanting to know how far in advance could I put the frosting on them? Awww!!! I love it!! Thank you! Be sure to take pictures and share!!! You can put the frosting on several days in advance as long as you cover them with something air tight and refrigerate them. I like the 6 pack cupcake containers on cuptainers.com. They do a great job of storing my cupcakes and keeping them fresh. Take the cupcakes out of the fridge about 1.5 hours before serving! Hope you and your daughter do have a fairytale event!! This was so magical. I shared this comment on my Facebook. It made my heart smile :). It's like my rainbow glitter heart traveled to you through the recipe!!!! I'm so happy you enjoyed, and I hope you create many more special memories! Hi Amanda! I am so excited to make these for my daughters first birthday party. It's unicorn themed! Do you think it Would it be okay to make the cake the night before and frost it fresh in the morning? I am Trying to figure out if it will hold up okay overnight in the fridge if done completely the night before. I don't want the frosting to fall if left out or harden if frosted and then put it the fridge. Ahhhh first time mommy jitters! Lol thanks again for making something so awesome and sharing it with us! LOVE your ideas & all the extra tips in the comments. I'm making a Jukebox cake for my husband's "Decades" birthday celebration & wanted to make tye-dye cupcakes, as well. The more I can do ahead, the better! When you make the cupcakes a few weeks ahead & freeze....does it make a difference in taste if you freeze the cupcake & frost later....or frost & freeze? I'd probably mess the frosting wrapping them in plastic. Thought about getting some plastic cupcake holder like those bakeries use. Any tips on "wrapping" would be appreciated. Glad that you are feeling better & back to blogging! So the funny (ok, maybe not funny "ha ha" but rather interesting) thing is with all of the debate (some nice, some not so nice) here about disco dust (or whatever it is called) there has been no discussion about how to get the colors in the cup cake part not to be slightly off. I saw one question about it but no real answers. I made these last year for my daughters birthday (minus the disco - and thank you to whomever it was that pointed out the issues with eating an non edible food item) and didn't think about them again. I went to pull the recipe out of my file and found some notes that I had made when I made them last and thought one might be helpful to others. Instead of using the whole eggs in the batter (the yolks are what effect the dye/final colors of the cake) I had substituted egg whites only and the colors came out true and unaffected. This I learned from when I made her first rainbow cake 4 years ago. Apparently rainbows are still very popular in my home. Thanks for sharing! The marshmallow buttercream recipe is to die for. I used it on my daughter's first birthday cake this past week, decorated as a unicorn of course! Everyone raved about the frosting. Hope it is okay I linked to this post with the recipe from my blog. Thank you again! what stand mixer attachment do you use for the frosting? The homemade fluff frosting is what makes the frosting so delicious. I made these for my daughters birthday party and they were amazing. I had to use a different name brand food coloring but the colors were “unicorn” like and everyone loved them! First time ever making frosting and piping! Thank you! These cupcakes are so tempting and beautiful, our little champs will definately like the bright colors. I attempted to make these and idk what I did wrong... but the batter was EXTREMELY thick and they didnt turn out right. Does the buttermilk have to be a certain kind? I'm not sure what I did wrong. Hi love! My apologies, I never saw this comment until now! I double checked my recipe and it is what I always use and works great. I am not sure what could have gone wrong if you followed the ingredients as listed. I hope you will try again and if you have issues trying it another time inbox me and we can discuss. I love it! You are so welcome! Send Online Cakes, Cupcakes, Designer cakes and Gifts etc across India. The "Fun" In "Funfetti!" 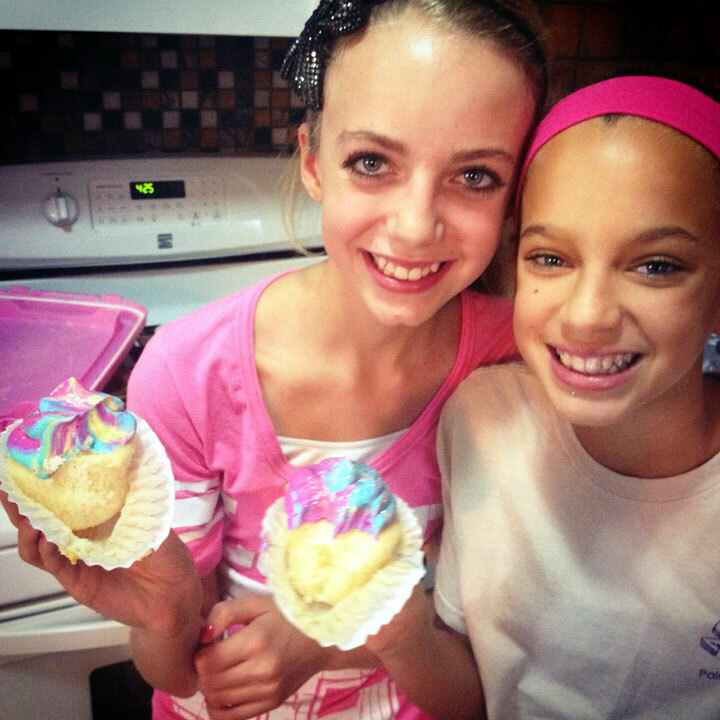 Cake Batter Cupcakes!